Fred Harrison and Dr Roger Sandilands explain why economics as an intellectual discipline is in urgent need of interrogation. In Taxed to Death they claim that the inquest is a matter of life and death. Governance, they argue, is prejudiced by theories that are intentionally designed to accommodate the structural flaws in the economy. Interventions by ideologically driven professors of economics since the onset of universal suffrage were, in the main, calculated to distort democracy by depriving law-makers of the insights from classical economics. As a result, governments were inhibited from adopting the fiscal policies that would deliver inclusive growth within cohesive communities. Fortunately, scholarship has its heroes as well as its villains. A band of scholars and practitioners were willing to risk personal preferment to develop policies that would remove barriers to the full and equal lives that everyone could and should enjoy. 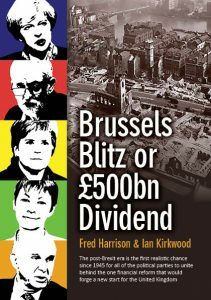 Fred Harrison and Ian Kirkwood describe the post-Brexit era as the first realistic chance since 1945 for all of the political parties to unite behind the one financial reform that would forge a new start for the United Kingdom. 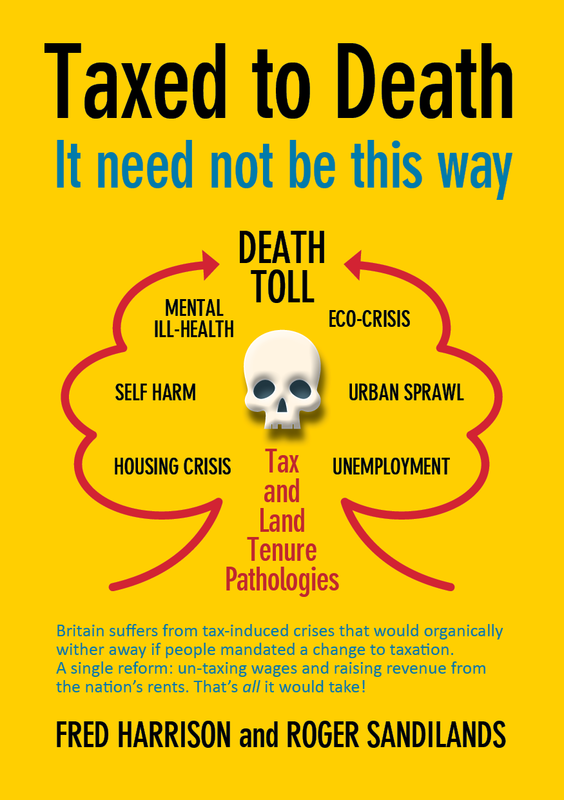 It entails the migration from a system of taxation which represses production by at least £500bn a year to Annual Ground Rent (aka Land Value Tax). Over the past 300 years, the peoples of the four nations laboured under a tax regime which imposed an artificial ceiling on productivity. Those taxes continue to create havoc in people’s lives. The only viable strategy for the UK is a fiscal reform-led programme that organically restructures the economy to replace rent-seeking with value-adding enterprise. This would re-balance relationships between the regions by eliminating the bias that now favours London. And it would transform the City of London to secure prosperity across the kingdom. A national conversation is needed to create the democratic mandate that authorises the re-design of the public’s finances. The leaders of all political parties must agree to work together to eliminate the internal barriers that rupture people’s health. Twice in the 20th century the people of Britain mandated the structural reform of their finances. Twice the law was enacted. Twice, Parliament failed to honour the “rule of law”. Will Holyrood and Westminster now grasp the opportunity offered by Brexit to bring our nations a new kind of prosperity? 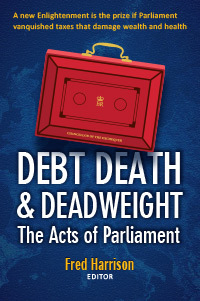 The authors of Debt Death & Deadweight explore the revenue-raising alternative to taxes that destroy people’s wealth and welfare. How UK production is curtailed by £500bn every year is explained. Losses might be greater, or less, but the public cannot judge because HM Treasury will not disclose the loss it imposes on Britain. When governments fail the test of transparency in their financial dealings, doctrines like equality before the law are dishonoured. 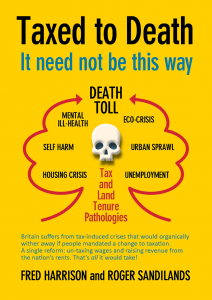 According to one of the authors, that is why tens of thousands of people are allowed to die every year from pathologies that are ultimately caused by anti-social taxes. In an authentic democracy, Parliament would be held to account for those losses. Democratising the public’s finances would make it possible to resolve crises like unaffordable housing, income inequality and under-funded public services. And thousands of people would be freed to enjoy up to 20 years longer of life on earth.